People Against Live Exports and Intensive Farming - What can I do? People Against Live Exports © in Conjunction with RSPCA QLD. Australia was formed in 2000 by Wendy Lewthwaite. Halal is a Qur’anic word meaning lawful or permitted. In reference to food, it is the dietary standard, as prescribed in the Qur’an the Muslim scripture. Within the Islamic religion, a strong emphasis is placed on cleanliness - both spiritually and in the context of food and drink. For a food or drink product to be approved for consumption it must conform to the Islamic dietary laws as specified in the Qur’an. 3. Whether or not the material is harmful to health. 6. To maintain self-respect and integrity. Cruelty to animals is an absolute not allowed. You must not show a knife to an animal you are about to slaughter because it is considered as killing it twice. Strict laws and is punishment for cruelty to animals and is not tolerated. One of our major concerns is that Halal rather than profit is used as an excuse for live export trade. The potential for chilled meat exports to substitute for live exports is recognised by key players in the Australian meat processing sector and Islamic communities in Australia. 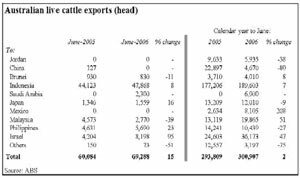 Australian live cattle exports in the 2005-06 fiscal year ended, with exports during June jumping 15% on the previous year, to 69,288 head. The value of live cattle exports for June was also up, increasing 18%, to A$43 million. Australian live sheep exports during June remained strong, with exports for the month totalling 272,708 head – an 82% increase on June 2005 levels. Exports for the month were valued at A$19 million, averaging $69/head. Demand for live sheep from the Middle East is expected to remain strong in the coming months, with the Muslim fasting period of Ramadan and associated festivities commencing at the end of September. 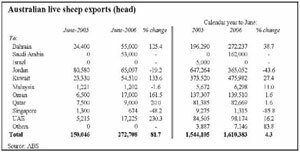 Australian live sheep exports for the 2005-06 fiscal year totalled 4.3 million head – a 31% increase on the 3.2 million head exported during 2004-05. The value of the trade for 2005-06 totalled A$297.2 million FOB, up 41% on the previous year. Recent reports have come to light which detail the role of governments in distorting the prosperity associated with the live export trade. The report by S.G Heilbron "Impact of the Live Animal Export Sector on the Australian Meat Processing Industry" indicates that live exports could be costing Australia around $1.5m in lost GDP (Gross Domestic Product), around $2.7m in lost household income, and around 10,500 in lost jobs (the AMIEU puts that figure closer to 20,000 jobs). There is the associated factor of fragmented communities resulting from these job losses. A further report commissioned by the Western Australian government has brought more bad news for governments supporting the cruel live export trade. Professor Lindner, a leading agricultural science academic has highlighted the fact that the degree of governmental intervention in favour of the live export trade is instrumental in forcing up the prices of local meat, by subsidising the AQIS inspection fees in the live export trade to the level of about $400,000 a year, while charging local abattoirs each a similar amount - in Western Australia alone. For as long as live exports continue, chilled meat exports will not realise their potential. Numerous reports have found that live exports compete directly with exports of processed meats in the same markets, signifying the demise of the former would be compensated by a boost in the latter. Since the 1970's the meatworkers union has opposed live exports on the basis of its destruction of Australian jobs, its inhumane treatment of the animals and the decimation of the meat processing industry. Since that time at least 25 export meatworks have closed in Australia and more are still closing at the present time. Processing plants in the top end of Australia have been decimated with only two remaining in operation at Townsville and Innisfail in Queensland, with sporadic kills at Katherine in the Northern Territory. The great majority of cattle in the Northern Territory are exported live. Australia exports 6 million plus sheep each year mostly to the Middle East. It is estimated by processors that with 6.6 million sheep exported in 2002 this equates to 2,500 full time jobs if processed in Australia. If one such job sustains seven jobs in the wider regional community that means that 17,000 jobs are lost due to this trade. Processing plants are these days located in regional areas and the loss of jobs in these areas, some where the processing plant is the major or the only employer in the town is catastrophic for both workers and the community. Instances of this in recent times have been Guyra, Aberdeen, Blayney, Yallah, Lismore and, more recently, Forbes and Mudgee and that is only NSW. To combat the decline in the use of Australian based facilities and labour, Halal Kind Meats (HKM) and the Australian Federation of Islamic Councils (AFIC) have reached and performed significantly preparatory work in relation to establishing Halal Abattoirs in Australia. Halal Kind Meats have investigated and wishes to trial a new more humane slaughter method of the slaughtering of the larger beasts as opposed to stunning of the animal. This is of considerable interest to (AFIC) the Australian Federation of Islamic Council and Halal Kind Meats as it appears this matter of slaughter will not damage the skull and the brain on the animal. Through partnership alliances between farmers, meat processors and Islamic meat importers a profitable venture may be formed in order to gain greater volumes of processed chilled meat exports. This alliance will create work opportunities in rural centres therefore building further wealth opportunities in Australian country areas. For this venture to be successful it is important that the Islamic importers be allowed to invest in co-joint venture operations such as farming, abattoirs, and exporting the processed product. This form of joint venture alliance will safeguard Australia’s farmers, workers and industry as the captive end users are financially involved in the complete process. Halal Kind Meats offers the opportunity to resurrect one of Australia’s greatest rural industries. Farmers and Abattoir owners may sell a share or lease their property to the purchaser or supplier. This gives the opportunity to set up as an exporter setting their own price and cutting the middleman. Halal Kind Meats will assist in arranging export licensing and accreditation at their own cost. Also they are prepared to introduce funds to existing or disused abattoirs to upgrade these premises to export/Halal standards. Farmers will be running their own co joint business either by lease arrangement or any other arrangement they wish. There will be no commission or agencies fees charged to farmers to establish share farms. Halal Kind Meats will simply introduce the farmer to one or several potential partners. It will be up to the farmer and the potential partner to negotiate the final deal. Halal Kind Meats will be available for advice which again is supplied to farmer at no cost. Some farmers are in financial difficulties and it is Halal Kind Meats sincere wish that they can help them. The concept of the co-joint farming is to allow the farmer the necessary capital and cash flow to continue and grow their business whilst maintaining control over the way the business is operated. Obtaining overseas investment is by no means selling Australia out. The Halal Kind Meats concept is to obtain investment from the importer thus securing export contracts for the refined product. Through co-joint farming and meat processing Australia’s rural meat industry will be able to sustain a greater volume of chilled meat exports; the countries rural workforce will once again grow and have a greater level of security as overseas investment will be long term; and by expanding our rate of processing Australian meat in Australia we will be saving a large amount of livestock from a long and cruel overseas journey. The Halal Kind Meats concept is a win/win situation for all involved. Overseas investors, rural industry leaders and animal rights groups all realise that the proposal to share farm and re-open and upgrade abattoirs via overseas investment will create prosperity for struggling regions of Australia. Now all we need is for the Australian Federal and State Governments to realise the advantages of this concept and give it the support that it deserves.